The LG CQ18 5.0kW Console Floor Mounted Indoor Units are a new design with a flat/low profile flat appearance, and is very easy to keep clean. The unit includes the new user friendly controller and filtration system which destroys funghi, bacteria and viruses. This combined with the main Photocatalytic Washable Deodorizing Filter, provides healthy clean air for the occupants. 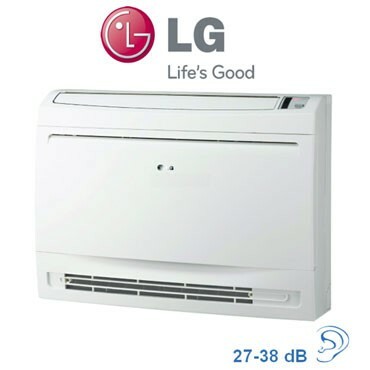 LG has used its innovative technology their new high and low air movement fan arrangement for optimum heating and cooling. 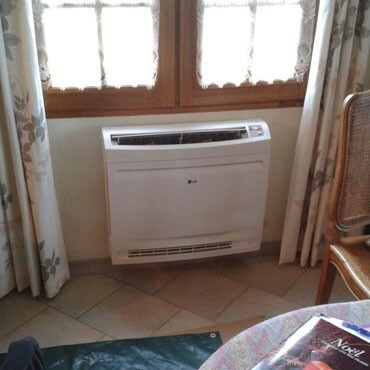 The result is a quiet, high performance cooling and heating system, with advanced electronic controls for maximum comfort, controllable and energy efficient. The slim indoor unit has a reduced depth of 210mm. The new multiple stage heat exchanger is folded to form a surround to the upper section of the fan enclosure. This ensures low air velocity, and reduced sound levels, whilst delivering high performance and efficiency. The unit produces an amazing 4.19 x input or 4200 watts for 1000 watt input in heat mode. 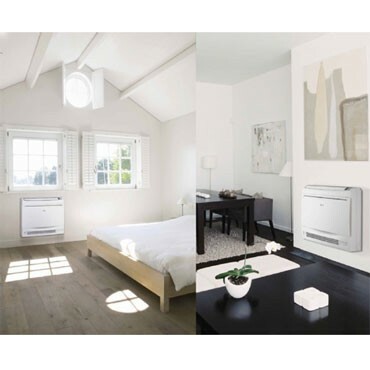 In heating mode: Both lower and upper outlets operate with Auto fan speed mode, the lower outlet will be kept for twenty minutes after the start or until room temperature is close to reaching the setting point. And then the air outlet will change to both outlets. That state will be maintained until the switch is turned off. Automatic adjustment of lower air outlet direction prevents stirring up of warm air and keeps optimum comfort at floor level. 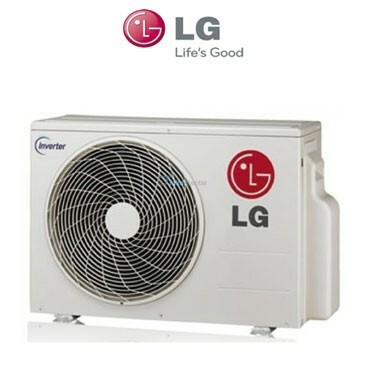 In cooling mode: In case both lower and upper outlets operation is selected in cooling or Dry operation, both outlets will be kept for sixty minutes after the start or until room temperature is below the setting point. And then the air outlet will change to the upper outlet. That state will be maintained until switch is turned off. In case both outlets operation with Auto fan speed mode is selected, the upper outlet will be kept for ten minutes after the start or until room temperature is close to reaching the setting point. And then the air outlet will change to both outlets in order to spread comfort air to every corner. 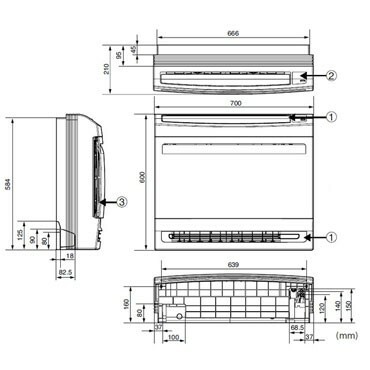 Question about 5.0kW 18000Btu Floor Console Inverter is Successfully Submitted.